This remarkable Israeli drone not only offers gigapixel views, but remains on station for thirty hours of persistent surveillance. Developed specifically to address requirements raised by defense and law enforcement agencies, responding to natural disaster recovery events, terrorism and homeland security threats, SkEye WAPS comprises advanced capabilities in the field of imagery intelligence gathering, providing a complete high-resolution picture and up to 80 square kilometer coverage of the Area of Interest (AOI) to a large number of users. SkEye WAPS provides a clearer picture in less time, thus exponentially increasing trust in the decision making process. While looking over a large Area-of Interest (AOI), operators can zoom into multiple Regions of Interest (ROI) simultaneously and understand the connection between them. This is achieved without neglecting the rest of the area, which is still being recorded and constantly analyzed. 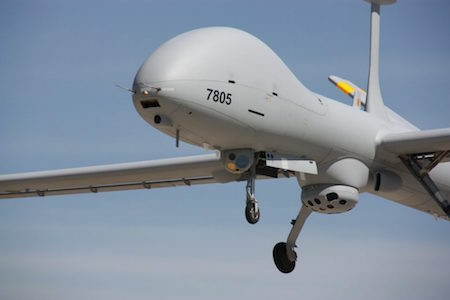 At the heart of the system is an airborne segment consisting of the EO sensor unit, an advanced image processing unit, a large mass storage unit and analysis applications. I sent my eyes on their rounds and tended my gallery of one hundred-thirty changing pictures, on the big wall of the Trouble Center, there atop the Watch Tower of Town Hall... My eyes, coasting weightless along magnetic lines, began to blink. I knew then that we were in for something. I sent an eye scurrying off toward Saint Stephen's at full speed, which meant a wait of about twenty minutes until it topped the range. Another, I sent straight up, skywards, which meant perhaps ten minutes for a long shot of the same scene. Then I put the auto-scan in full charge of operations and went downstairs for a cup of coffee.